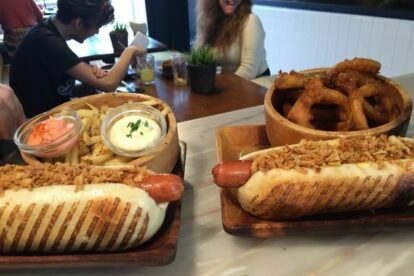 Frankie Hot Dogs – Pick your sausage! Talking about hot dogs is a very sensitive topic for me. I love hot dogs. But on the food chain, hot dogs fit into snacks. Food truck stuff. But a friend of mine told me once about this Frankie place. She told me she went there with a group of friends and that she was very impressed they had replaced the hot dog, because one person in the group wouldn’t eat that specific type of sausage. So they changed for another one with no cost at all. With all this, I was curious and went there to give it a try. And since then I have come back regularly every month. I love the place, the hot dogs, the selection of sausages, the onion rings, the french fries, the different types of lemonades, the speech they give us, before ordering, about the possibility of selecting any sausage, the kindness which we are always welcomed, even when it’s fully crowded. And Veggies alert, there is a veggie sausage! That’s another thing. Normally it’s jam-packed, with lines streaming out the door. Probably because there is a campus and a school nearby. So when I go there, the best time is after 15:00 and before 19:00. Or I just face the crowd, which is actually fun and runs smoothly. My favourite hot dog is the Crispy Cheddar, followed by the Tuga, with fried egg. When there is a Tuga option on the menu, it’s always a good choice!